Disclosure: This post contains affiliate links to the products I recommend. Sick of the empty calories? Gluten-free noodles often lack taste, texture and are loaded with unnecessary calories and carbs. Yuk! When I was diagnosed with celiac disease in April 2012, I found myself on a mission to find a good gluten-free noodle. I loved eating noodles so much! But in my effort to find the perfect gluten-free noodle, I stumbled across something even better. I discovered the world of amazing gluten-free pasta alternatives – ones that aren’t make with rice flour and are instead made from plant products. They have few carbs and are actually, dare I say it, good for you! OK, so I do miss noodles. There, I said it. But there are plenty of ways to enjoy pasta without having to fill our bodies with excess carbs or calories. I think you’ll find these five gluten-free pasta alternatives do the trick! So banish the bloat, say goodbye to empty calories and load up on these amazing gluten-free pasta alternatives. These noodles seriously taste amazing! And on top of that, you don’t feel like you’re eating gluten-free noodles, yet alone noodles made exclusively of soybeans and water. Edamame spaghetti is just 200 calories per serving. That’s right. Only 200 calories per serving. But that’s not the most exciting part. The most exciting part is that each serving contains 24 grams of protein and 11 grams of fiber. Bam! The only ingredients in this pasta are organic edamame (green soybeans) and water. On top of that, these noodles are packed with vitamins A and C, calcium, and iron. I personally feel like they taste like real noodles so I can eat a bowlful of them without any guilt. Stock up on edamame spaghetti by Explore Asian on Amazon. Explore Asian also makes black bean, adzuki bean and mung bean pastas. I enjoyed the gluten-free mung bean pasta as a side dish to my Asian Salmon recipe. Miracle Noodles really do live up to their name. Yes, they are little miracle noodles for sure! I wrote a glowing review about Miracle Noodles last year. Each package contains only 15 calories (5 calories per serving), so you can pile these noodles high on your plate for a totally satisfying and bountiful meal. In case you’re not familiar with Miracle Noodles – they are made from purified water, konnyaku flour (a spongy plant popular in Japan cuisine), β-carotene, and calcium hydroxide. These noodles pack tons of fiber and help you avoid eating excess calories. You can buy Miracle Noodles shirataki noodles online (check the Miracle Noodle website for deals!!). You can get 10% off your purchase when you shop through this link. If you’ve followed my blog you know that I’m huge zucchini noodle fan. You also know I’m hooked on the Veggetti, a little tool you can use to twist a zucchini into spaghetti-shaped spirals. These noodles – or zoodles – are so easy to make too. Simply twist an entire zucchini in your Veggetti, and then either microwave the noodles for one minute until just softened (but not too soft) or boil them in hot water for 2-3 minutes. You can also saute them in a pan with a little olive oil for 2-3 minutes. Zoodles offer an easy, no-fuss and no-guilt way to enjoy yummy noodles! You can get a basic Veggetti for about $12 on Amazon and is well worth the investment! My friend Shayna first introduced me to black bean noodles last year. She told me how good they were and how wonderful the texture was. It took me forever before I actually took the time to make them and try them for myself. Wow! I’m so glad I did because these noodles are awesome! What took me so long?!? Black bean noodles are also made by Explore Asian, the same company that makes edamame noodles. These gluten-free noodles are perfect for anyone who is gluten-free and soy-free as well. Even if you think you’d never eat black bean spaghetti, I know these noodles will make a believer out of you. Each serving is 180 calories and contains 25 grams of protein and 12 grams of fiber. Like edamame spaghetti, the only ingredients in these noodles are organic black beans and water. Don’t worry, they don’t taste like beans at all; they truly taste like pasta. Just to convince you further that these are amazing noodles – my kids ate them up with no fuss and even asked for seconds! You can buy black bean pasta on Amazon. The old trusty gluten-free noodle needed in a pinch is spaghetti squash. If someone is hosting me for a spaghetti dinner, this is the easy gluten-free alternative for them to make for me. Why? Spaghetti squash is readily available at grocery stores nationwide and easy to make without any tools or special purchases (like a Veggetti). While spaghetti squash is GREAT in a pinch, it’s not my favorite gluten-free noodle alternative. That said, spaghetti squash offers a nutritious and totally satisfying meal, so it’s worth inclusion on my top five gluten-free pasta alternative listing. At 31 calories per serving, this fiber-loaded spaghetti can be eaten by the bowl full – and it’s loaded with vitamins A, C and B6, potassium and calcium too. There you have it – FIVE amazing noodle alternatives that are gluten-free and good for you too! Please share this article with anyone who is following a gluten-free diet, low-carb diet, or who is just looking to eat more healthily. Thank you! I just tried Banza’s chickpea GF noodles and love them so much that I had to add a sixth gluten-free pasta substitute to this post!! 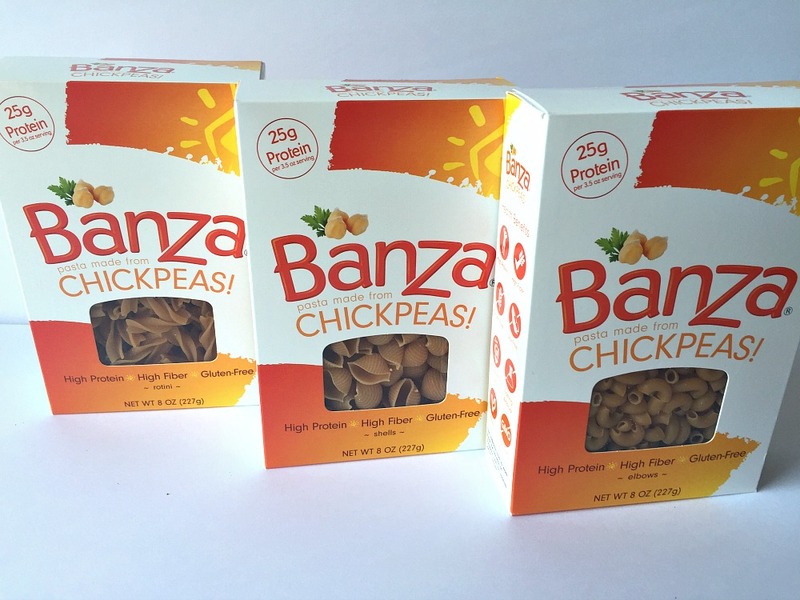 Banza noodles are made from, you guessed it, chickpeas! They are a delicious and nutrient-dense, gluten-free low carb pasta substitute. The texture is awesome too. You also can purchase Banza on Amazon. Are you transitioning to a gluten-free diet and need help? Are you trying to eat better this year? Please visit my Health & Nutrition Counseling page for more information on my health coaching packages.